Last night, the fifth and final day of Toronto Fashion Week offered a grand finale of embellished evening gowns and luxurious detail. As another season on the Toronto runways came to a spectacular close, the catwalks revealed an array of dramatic designs for Fall 2016. From a bold first impression from emerging designer Paola Gamero to an energetic closing show at Greta Constantine, here’s our report from under the tents at David Pecaut Square. The Peruvian-born designer originally studied administration at the University of Lima, but later switched her focus to design and trained at Milan’s Instituto Marangoni. At Toronto Fashion Week, Gamero unveiled an eveningwear collection which consisted of voluminous gowns. On the runways, sensual deep shades of black, navy blue and plum, ornate lace detail and sultry cut-outs all made a statement. 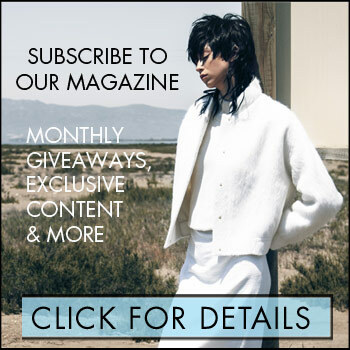 Launched in 2014, MARAM was founded by Egyptian-born, Paris-trained and Montreal-based designer Maram Aboul Enein. For Fall 2016, the emerging designer featured an edgy astrology theme, with funky star patterns dominating the collection. The motif made its way onto leather jackets and flowing sheer frocks, with a chic black and white colour palette offering the illusion of mystery. 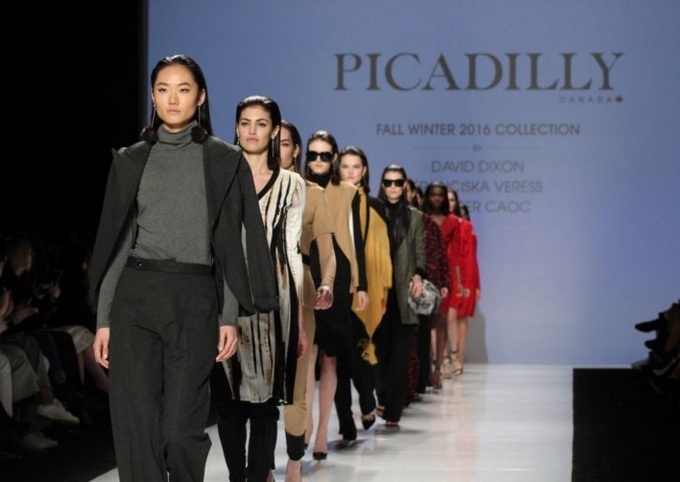 Although this season marked the Toronto Fashion Week debut of Toronto-based label Picadilly, it was also the brand’s 40th anniversary. 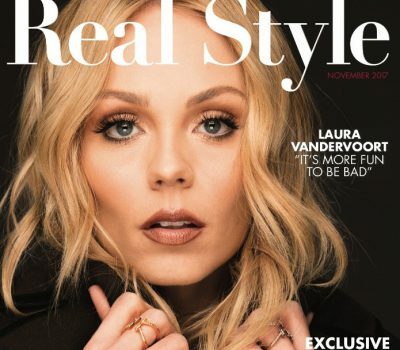 To mark this milestone, the local clothing line joined forces with Canadian designers David Dixon, Joeffer Caoc and Franciska Veress. On the runway, slouchy white jumpsuits shared the stage with black and white textured jackets, mustard hues and vivid red frocks. The occasional neutral knit turtleneck, combined with simplistic black trousers and camel-coloured styles, proved that understated and wearable looks can certainly be stylish. There was no mention of minimalism at Di Carlo Couture, where Montreal designer Antoinette Di Carlo presented her new collection of haute couture bridal and evening wear. 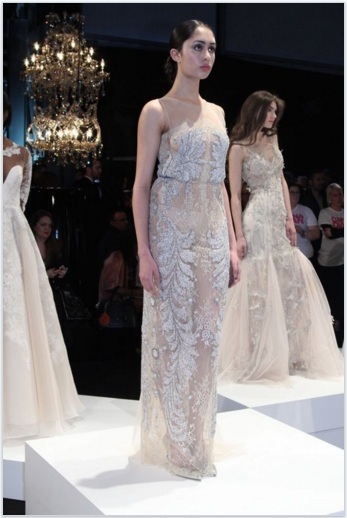 Models posed in ivory fairytale frocks, adorned with girlish white lace and delicate embellishment. Deep sweetheart necklines, sheer detail and flowing satin sleeves were all on display, as the look of barely-there straps and pleated hems set a romantic mood. 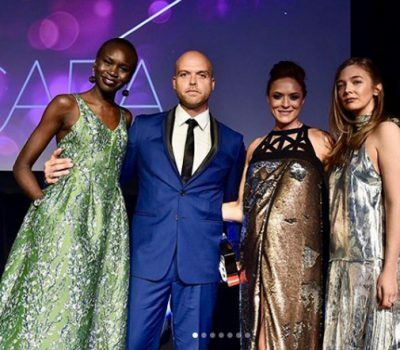 At Caras, established Toronto-based designer Stephan and his son, Kyriako, found their design inspiration in the seductive spirit and glamour of the after hours. For Fall 2016, the aesthetic at Stephan Caras channelled the elegance of nighttime, with a bevy of deep midnight blue shades marking the collection. Gowns were finished with high-drama feathered hems, while the label’s signature sultry detail was evident in a series of side cut-outs. Glitter, ladylike midi hems and sparkling floral embellishments also shimmered on the catwalk. In honour of their ten year anniversary, Toronto-based women’s wear label Greta Constantine took to the Toronto runway in true celebratory fashion. Co-creative directors Kirk Pickersgill and Stephen Wong revealed a show which sizzled with rock and roll spirit, as models strut the catwalks with smeared eyeliner and slick hair. Tops with oversized bows, metallic pleated skirts and a signature cartoonish lip and eyeball print were all key looks. 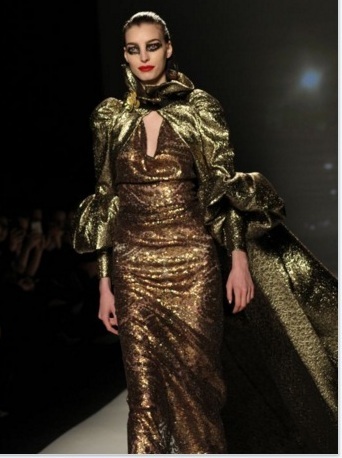 Meanwhile, floor-length gowns in sparkling metallic tones were accented with lavish flowing capes and puffed sleeves. The show wrapped on a high note, with Pickersgill and Wong strutting out onto a catwalk festooned with gold confetti. As the co-creative directors received a standing ovation, a marching band burst out into a lively rendition of Pharrell Williams’ Happy, closing the show with the ultimate happily ever after ending.